With numerous features and top quality finishing, this home was originally built as a show home for ICFhome.ca, a local custom home builder. 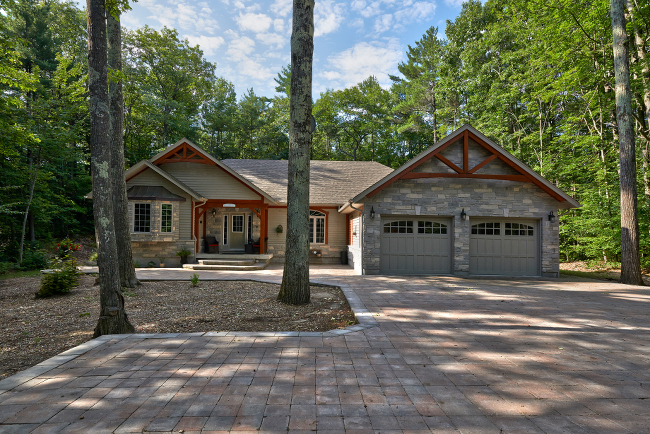 This award-winning model is located in an established neighbourhood of private lots with character cottages and new family homes, 1 1/2 hours north of Toronto, in Township of Tiny, in the heart of Georgian Bay, around the private setting of this almost ¾ acre lot. Immaculately landscaped with 6000 sq.ft. of patio stone, it offers a unique natural setting and privacy; just a 2 minutes walk to the beautiful beach and just a 15-minute drive into the town of Midland. It boasted approximately 3950 square feet of luxury living space, starting with Owen Sound ledge-rock stone, post and beam details – cut and milled locally, copper and architectural shingle roofing. The entrance that is warmly elegant spotlights the posts and beams that are the visible bones of this energy-efficient home. Inside you will find, soaring vaulted 13’ ceilings, solid wood post & beam custom finishes, coffered ceilings and gleaming hardwood floors. The workmanship and artistry that once went into many farm homes remind us of the rewards of preserving our past while striding into the future. There are five bedrooms and three luxurious baths, a large eight-person sauna with change room, 12’ x 22’ theater room and a cold room. The custom kitchen features a large center island with sit-up bar and wine rack, slate backsplash, custom wood cabinetry and pot lighting. The large adjacent great room includes a full stone fireplace and access to the new cedar ground level deck.